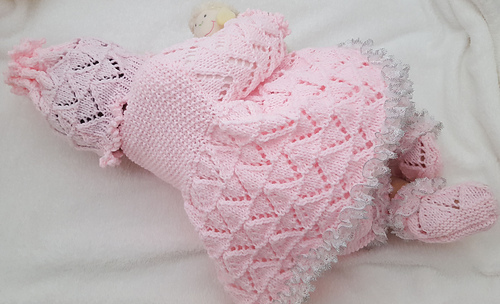 A lovely, easy to knit pattern which makes a super gift for a baby girl. The pattern consists of a traditionally styled round necked matinee jacket with pretty scalloped detailing on the cuffs and a lace eyelet design used on the skirt with a moss stitch bodice. A layer of knit in lace is added at the hem line. The hat has a draw string top with picot detailing to frame baby’s face. Make a complete baby homecoming outfit by adding the bloomers and matching baby booties. To Fit Sizes Newborn & 3+Months with finished Chest Sizes of 14 & 16in. To knit the set you will require approx 250g Stylecraft Baby Double Knitting Yarn (Light Worsted) 0r Baby Twinkle Yarn .